Joining the likes of New York Giants head coach Pat Shurmur and Nebraska head coach Scott Frost, Ohio State’s Ryan Day is the next protege of former Oregon head coach Chip Kelly to become a head coach when he takes the job on Jan. 2 after the Rose Bowl. But like Shurmur and Frost, Day’s sole focus throughout his coaching career, throughout stints with Temple and Boston College, to a trip to the NFL as the quarterbacks coach under Kelly for both the Philadelphia Eagles and the San Francisco 49ers, has been on the offense. As he was introduced as the 25th head coach in Ohio State history, he began to talk about what he is known for. With a reference to the transition at quarterback — from J.T. 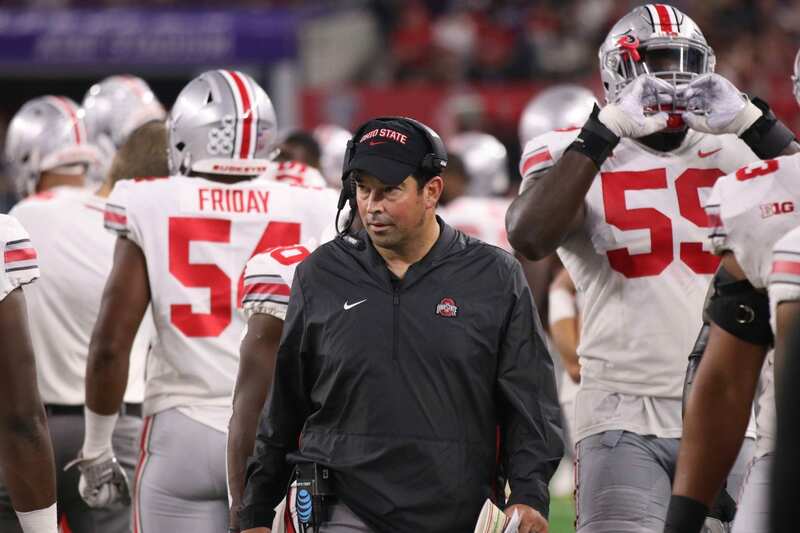 Barrett to redshirt sophomore Dwayne Haskins — the offensive-coordinator-turned-head-coach talked about an adaptive offense, one that would continue to modify to the personnel the team has each year. Then Day moved forward. He began to talk about the part of football he used to plan against, not plan for: the defense. And that was it. Day would not specify what changes he plans to make on his coaching staff, what the future of defensive coordinator Greg Schiano or co-defensive coordinator and safeties coach Alex Grinch would be. In the short term, this was not the focus, as the attention moved toward the Dec. 19 early signing period. But even with that aspect, Day admitted the relationships he had built on the road recruiting had not been as strong with the defensive players. But players did get a taste of what it would be like to play under Day when Meyer was suspended for the first three games of the season. While the offense scored more than 40 points in each of those contests, the Ohio State defense survived, allowing 31 points and 28 points to Oregon State and then-No. 15 TCU respectively, but keeping Rutgers to three points and 134 yards of total offense. When Day took over the team, junior defensive end Jonathon Cooper said he was impressed with how the team never really missed a beat, saying he handled the position with calm and ease, settling the team down and handing Meyer back the team with a 3-0 record. But even after Day returned to his normal role as the offensive coordinator, many defensive players still viewed him as a coach, as someone they could go and talk to. They viewed Day as the future of the Ohio State football program. No matter who is on Day’s staff for the 2019 season, Young said the players are the ones who define the program. As a head coach, Day’s job is to put his players in the best position to succeed, even with the highest of expectations for his team as he takes over for one of the most successful head coaches in the history of the sport. But when talking about Day, the defensive players do not bring up his defensive game plan or the amount he focuses on the offense, coming in with the specialty inherited from Kelly. The talk is of the upcoming head coach’s leadership, it’s the culture. It’s the head coach at the helm until Jan. 1. It’s Meyer.